For at least the next three and a half years, John Tory’s second home will be the mayor’s office, a light-filled space on the second floor of city hall with a ribbon of windows overlooking Nathan Phillips Square. Judging by the interior—with its minimal decorations and perfectly curated coffee table books—Tory is busy delivering on his campaign promise to make city hall boring again. “I’ve never been a person who focuses a lot on doing anything in particular with my office,” he says. 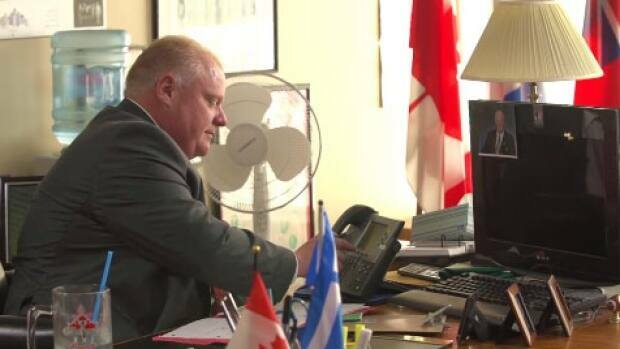 “I view it as a workspace.” (Rob Ford, by contrast, liked to plaster his walls with editorial cartoons about himself.) On closer inspection, Tory’s domain isn’t quite as dull as it first appears. I’m sure he had to bleach that desktop before moving in. Ford’s office was not bad. I recall one mini dance floor, a stripper pole, and a weird vip room, roped off in velvet with his initials sewn in gold. A pretty cool bar with top shelf! He even had a guy he called “boy” serve drinks. I thought that was a bit out of line, but when he laughed and said, “who cares, i don’t pay for it anyway.” I simply nodded and walked on. Cocaine and toilet paper stuck to my foot. It was a sad day. It’s great to see the original concrete (!) desk is still there. The people who built city hall in the 1960s wanted it to be a masterpiece to put the city on the world map–down to the furniture. A lot of it has to be restored now and is sitting in storage. Some politicians don’t want to spend the money, but it’s a good investment in the city’s architectural heritage. Spotted THE MOST MAGNIFICENT THING by Canadian children’s book author-illustrator Ashley Spires on the bookshelf! Excellent choice, Mr. Mayor. slaughter house to feed fat gluttonous humans who care little of anyone elses life. I hope not; if pigs weren’t meant to be eaten then why did God create barbecue sauce? Darn! They didn’t show if John taped photographs on the computer monitor screen, like Rob did, or not. Looks like a functional office with highly under utilized space.